John Crawley of the Motherwell club and Robert McPhee of the Glasgow club both successfully sat their 3rd Dan Black Belt Gradings in December 2016 and were presented with their new belts and certificates by Grandmaster Hock Aun Teh in March 2017. John: There were events happening in my life that were negative and out of my control and I felt that I needed something to focus my energy and mind on and the Tukido 3rd Dan grading was perfect for it. Rob: I have been training in Tukido for 25 years and I wanted to achieve my 3rd Dan before the end of the 25th year. I also wanted new challenges and to push myself so the time was right to undertake the additional training. Although I have never been in any rush to grade over the years, I have got a renewed enthusiasm to progress and continue on my journey through Tukido as far as I possibly can and continue to enjoy the many challenges that come with it. Rob: When I decided to commit to the grading, I really enjoyed the support, encouragement and professionalism of the Tukido Instructors who coached me throughout the process. I enjoyed pushing myself and even though I was very enthusiastic, I knew I was nowhere near ready and had a lot of work to do with Sparring Forms and power tests. Over the ensuing months I slowly but surely started to see progress. I enjoyed the inspiration that I got from the Instructors and fellow students – who gave me so much encouragement. Their enthusiasm for me to do well inspired me, lifted my spirits and kept me going. The inner drive and determination that I had learned through all my years of training kept me motivated to work hard. I also trained on my own, out-with normal class time so that I could video my Sparring Forms to see what I needed to work on. This really helped to highlight my strengths and weaknesses and was valuable to the overall preparation. John: Whilst training for the grading, I found myself more focused in and out of the classes. This helped me to overcome personal goals outside of Tukido as well as passing my grading. John: Injuries were easily the most difficult parts of the training. Just as I felt I was improving, I would injure myself that could set me back weeks. Rob: The most difficult and frustrating thing for me was trying to perfect the combinations and techniques and sometimes it was just not working out the way I had hoped. It was hard work training for at least 4 nights a week and towards the end of the 10 month process, I was finding my energy levels diminishing slightly. Naturally there are some occasions you are not in the mood or frame of mind but the Indomitable Spirit of Tukido tells us to get on with it. Rob: I enjoyed writing my essay on “How Tukido Changed my Life” and being asked to comment on that was enjoyable. I am always keen to express my love and admiration for Tukido and the essay allows students the chance to take time to express our thoughts on Tukido. The thing that is most difficult about the theory test is trying to remember numbers of movements / techniques. In hindsight, I should have given myself more time to prepare for the theory test. The reality of a Grandmaster Teh interview though is that you never know what you are going to be asked and trying to formulate answers to questions and put it into words on the spot is sometimes difficult. You know what you want to say but trying to express the words is sometimes difficult. John: Even although I had practiced numerous times and experienced the oral examination on several occasions, I was still nervous. John: I was nervous whilst warming up and then when I entered the hall I became more focused on the actual event and did not let anything distract me from doing my best. Rob: On the day of the grading I was more concerned about how to manage my energy levels, what to eat, when to eat, etc., so that I had sufficient energy at the right time for my performance. It’s all about the timing. Grading nerves will always be there at every grading but I guess if you know your Sparring Forms well and have built up sufficient stamina and fitness, then this should allow some confidence during the grading. I also felt a strong determination to do well and was very positive on the day that I actually passed. What did you enjoy most on the day? Rob: I enjoyed the team spirit. The students always want each other to do well and we all feel part of the same Tukido family. This is really evident during a grading – where we give each other support and encouragement to do well. I had been having some difficulties with some of the more advanced power tests in a previous grading attempt but as a result of regular practice, I managed to deliver the correct technique on the day to secure the breaks I needed. I felt that at the end of the actual grading there was a real positive buzz around the hall. I felt I had done enough to pass and was delighted that I gave a decent overall performance with maximum energy and to the best of my ability. John: I was very proud of my power test technique – front kick/turning kick without landing. I also enjoyed the sparring forms on the day. What did you find most challenging on the day? John: Twin flying side kick, I’m still annoyed that I did not break it on the day. Rob: The most challenging thing on the day of my 1st attempt at the grading was trying to find sufficient space to warm up. 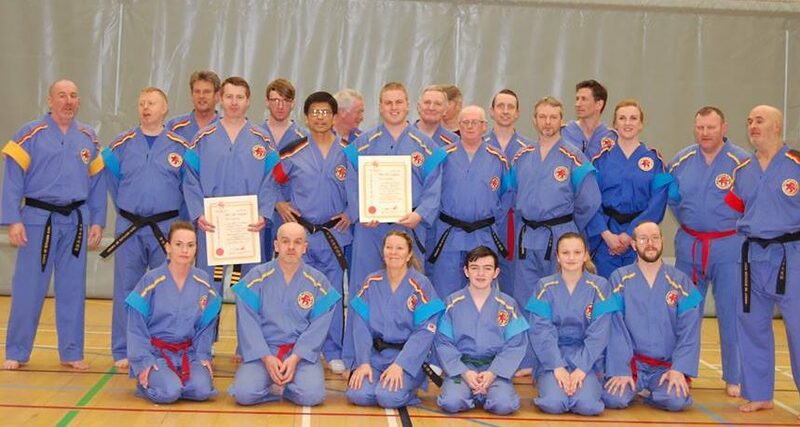 I was expecting a Black Belt grading with fewer students and found myself surrounded by Coloured Belts. Although I should be able to perform anywhere, this threw me a little and I wasn’t prepared mentally when the actual time came to perform and I felt rushed. This was not the case on the day that I actually passed the grading. I felt a lot more comfortable and determined on that occasion as I had more time to prepare physically and mentally. Rob: Given that it took me several attempts to pass 3rd Dan, I was initially relieved to have received the letter telling me that I had passed. Once the news sank in, I was extremely proud to have passed and achieved my goal of passing my 3rd Dan before the end of my 25th year of training. I was also feeling excited about learning the new 3rd Dan Sparring Forms. John: I was very happy about passing the grading. I was also very relieved at the same time. I felt I had worked hard and had performed at my best on the day of the grading. John: Right now my focus is on recovering physically and learning the new Sparring Forms. Rob: Even though I am required to wait a specified interval prior to sitting the 4th Dan grading, I am already looking forward to the preparation of it and mastering the 3rd Dan sparring forms. I am still highly motivated and continue to be inspired by this great art and our Grandmaster, Hock Aun Teh, and I want to continue to work hard and maintain a good level of fitness. Tukido has been a big part of my life for the last 25 years. I still love it and I’m very proud to be part of it. My hope is that we will have another chance to return to either Malaysia or China in 2018 and train there to further enhance my Tukido journey and experience.